A recent sponsored sleepout event outside the Northop Hall Hockey and Cricket Club is set to raise around £3,000 for two emergency accommodation centres for rough-sleepers, as well as the Wales Air Ambulance. 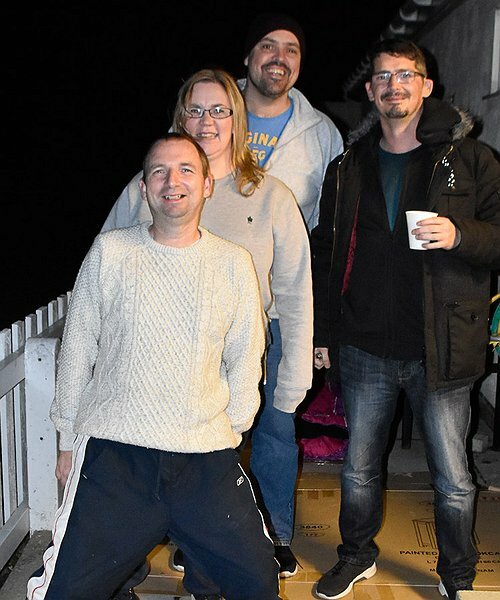 Dr Sarah Horrocks, Chair of Clwyd Alyn Housing Association which manages both the Tŷ Nos centre in Wrexham and Tŷ Golau in Rhyl, joined staff from the organisation to bed down outside the club for the night. They were also joined by friends from other organisations, the events coordinator for Wales Air Ambulance and a team of hardy volunteers from Jaguar Landrover in Liverpool who matched any funds raised by the Jaguar Landrover staff taking part. Also taking part was Clare Budden, Chief Executive of Clwyd Alyn Housing Association along with Executive Directors Paul Seymour and David Lewis who also braved the elements. “Conditions were pretty challenging with high winds and pouring rain at the start, however there was the safety of knowing facilities would be on hand in the Hockey and Cricket Club if needed. We can’t claim that the event reflects the isolation, potential danger or desperate circumstances that so many of our clients face, but simply committing to the experience was a way of showing solidarity and helping to raise awareness as well as funds. “The Wales Air Ambulance provides a vital service and the totals raised were split between this excellent cause and the support offered by the two Clwyd Alyn schemes for homeless people in Denbighshire and Wrexham. We’d like to thank everyone who supported us and also thank the Northop Hall Hockey and Cricket Club for letting us use their Clubhouse as a base,” Lynda added.